24 January 2018, at 12:00a.m. 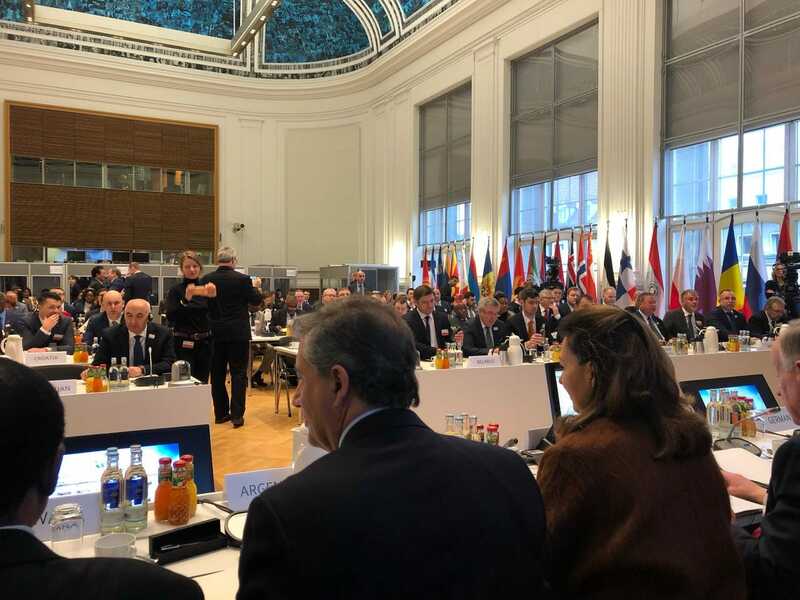 A delegation from the Ministry of Agribusiness, led by Luis Miguel Etchevehere, actively participated in the Global Forum for Food and Agriculture (GFFA). On this occasion, the German Presidency proposed as a topic of discussion, "Shaping the future of livestock in a responsible and efficient sustainable way". Minister Etchevehere, together with the secretary of Markets Agroindustriales, Marisa Bircher, participated in the meeting organised by the German government during Berlin’s Green Week, in order to promote the discussion of issues of the international agenda in agricultural matters. Ministers and deputy ministers from 69 countries, and representatives of international organisations, such as the OIE, FAO, IFPRI and the WTO, participated in this opportunity. In his capacity as Chairman of the G20 Agriculture Group, Minister Etchevehere led a discussion group on livestock and food security, which included, among others, the Ministers of Australia, China, Chile, Spain, The Gambia, Ghana, Holland, Hungary, Japan, Paraguay, Poland, with the support of officials from Germany and FAO. In the report of the group's conclusions to the plenary, Etchevehere highlighted "the indivisible link between food security and sustainable livestock production to adapt to the challenges of a growing demand for food, recognising the diversity of realities and interests of developed countries and in development, exporters and importers of food ". He also noted that, "livestock is a very important means for social and economic development not only of livestock producers but also of the population in general" and that "the scientific basis in decision making and responsible information is fundamental" to the public to avoid erroneous perceptions regarding the livestock sector and foods of animal origin ". Ministers adopted a ‘joint declaration’, in which in addition to highlighting these concepts, the importance of research, innovation and adoption of cutting-edge technologies, good agricultural and livestock practices, technology transfer to increase production efficiency is highlighted. They also agreed that an open and rule-based multilateral trading system is necessary to guarantee world food security, as well as international and cross-border cooperation among countries to eradicate animal diseases that affect production and limit the export capacity of countries. Within the framework of this meeting, Etchevehere had the opportunity to hold bilateral meetings with the Ministers of Germany, Australia, Brazil, China, France, Holland, Japan, New Zealand, Paraguay and the Commissioner of Health and Food Safety of the European Union and the Director General of the OIE. The delegation of the Ministry of Agribusiness was also integrated by the National Director of International Agrifood Relations, Omar Odarda and the Agroindustrial Counselor in the Argentine Mission to the European Union, Gastón Funes.